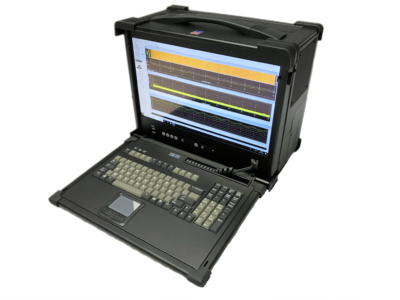 AcquiSTREAM-TR1000 is a high performance portable transient recorder. The recorder integrates all functionalities expected from a transient recorder. The hardware combines in a compact rugged portable unit, high-performance, Intel Xeon™ Silver 4 cores 3rd generation Windows10® PC with a large high-resolution screen, two slots acquisition for continuous recording and 4 slots data storage. Signal can be recorded in 12, 14, 16-Bit resolution at sampling rates as fast as 3GS/s.